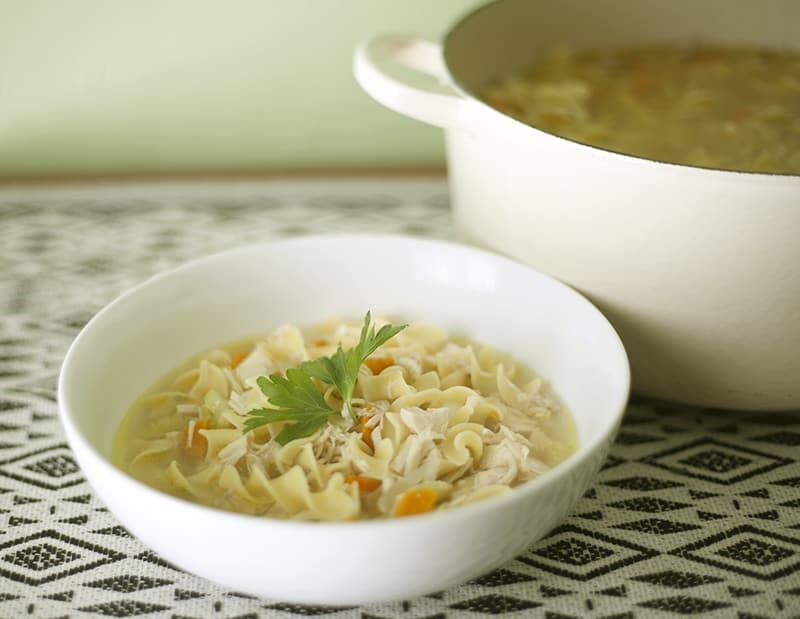 Are you looking for the best chicken noodle soup recipe? You’ve come to the right place. I’m proud to say that I have come up with best chicken noodle soup recipe. We have started making this once a week. We have it for dinner one night and then the kids bring it for lunch a few times a week. Once I realized how easy it is to make Perfect Instant Pot Chicken Broth, I never looked back. This alone makes it worth owning an Instant Pot, or a Bella Electric Pressure Cooker, which is what I use. It’s less expensive and works great. Doesn’t homemade chicken noodle soup sound so good right now? Start by making a batch of Perfect Instant Pot Chicken Broth and then follow our Best Chicken Noodle Soup Recipe. After a 5 days of my girls both requesting a can of chicken noodle soup in a thermos for lunch (bleech) I decided to try a homemade version with broth made in my electric pressure cooker. It is amazing! I’ve made a batch once a week ever since and I’ve even started eating it for breakfast. Heat the olive oil in a soup pot over medium heat. Add onion, garlic, carrots, celery, thyme and bay leaf. Saute for about 7 minutes, until the vegetables are softened but not browned. Pour in the chicken stock and bring to a boil. Add the egg noodles and simmer for 5 minutes until tender. Add the chicken, and simmer 3 minutes to heat through; season with salt and pepper. Sprinkle with parsley before serving.